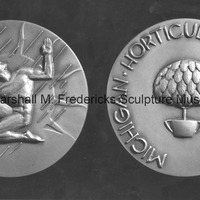 1941, minted in bronze, gold fill, and silver, diameter 3 inches, Michigan Horticultural Society, East Lansing, Michigan. Face: Bas-relief of sun and rain behind man planting a tree. Reverse: Inscription, "Michigan Horticultural Society," with bas-relief of potted topiary.